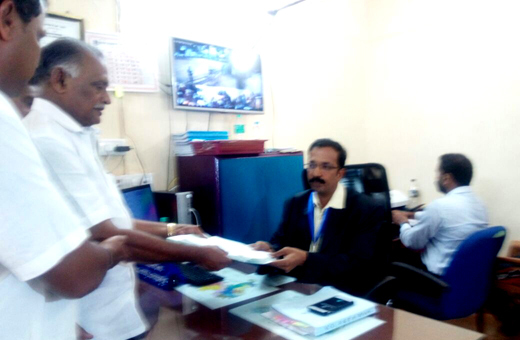 Mangaluru, April 19, 2018: Congress candidate B.Ramanath Rai and K.Abhaychandra Jain filed nomination papers in their respective constituencies on Thursday, April 19, 2018. 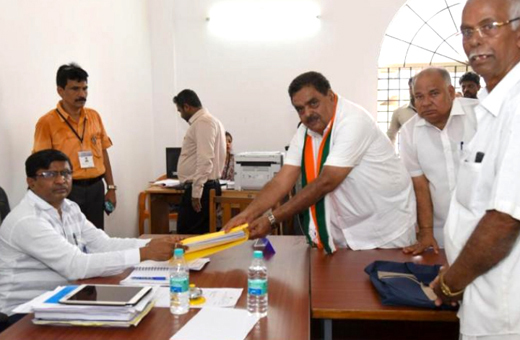 DK District in-charge minister and minister for forest, environment and ecology, Bellipadi Ramanath Rai filed nomination for the 8th time from Bantwal assembly constituency. He won the 6 elections from 1985 to 2013. 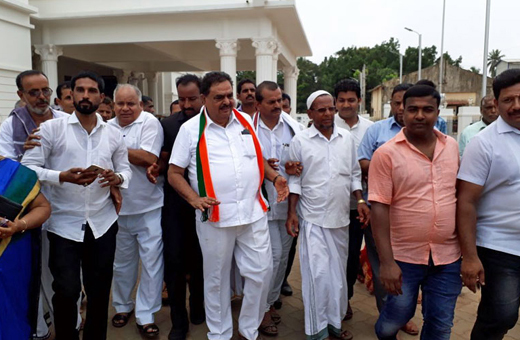 Ramanath Rai went in a procession to Bantwal taluk office along with his supporters and filed his nomination paper.Earlier, at a party workers meet, Rai said he has worked sincerely for the constituency during his stint as the MLA of Bantwal since 1985. "Congress is my religion. I am not contesting in any religion’s name. People of Bantwal have blessed me in the last six elections. I have worked as minister for home, excise, transport, Fisheries and Ports, and forest departments. I don’t want to reiterate my achievements. However, I can assure people of the constituency that I will work more if I am elected," Rai said. While former Minister for youth empowerment and sports, and fisheries K Abhayachandra Jain took out a procession from Swarna Mandira to Taluk office in Moodbidri to file his nomination papers from Moodbidri assembly constituency. The four-term MLA Mr. Jain is facing the election for the fifth time.